Cutest Christmas Comforters and Bedding Sets! My Favorite Christmas Comforters and Bedding Sets! I LOVE Christmas, it is my most favorite Holiday in the whole wide world! With Christmas comes Christmas decorations, Christmas lights, Christmas trees and also Christmas comforters for all your bedrooms! I have already started ‘hunting’ for the cutest Christmas comforter set around! I want to get one for my daughter’s queen bed and another one for my own bedroom too! They are all so HAPPY! Are you ready to choose one for you too? Looks like Santa Claus is definitely coming to town soon! This is a gorgeous Christmas tree with colorful Christmas lights design queen size duvet cover! Perfect to give your bedroom a ‘touch’ of the Christmas spirit! I think it makes a wonderful Christmas gift idea too! They are always elegant and not bulky! 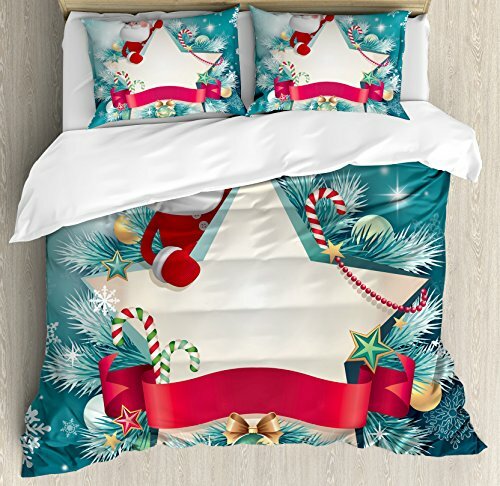 *To create a fun and colorful Christmas tree design bedding set, just get the two matching Christmas tree print pillowcases. How gorgeous, classic, luxurious and very ‘Christmas like’ is this amazing Holiday quilt? It basically has all Christmas colors and it’s very ‘Merry’! Great to give your master bedroom a happy Christmas touch! Merry Christmas Duvet Cover Set! 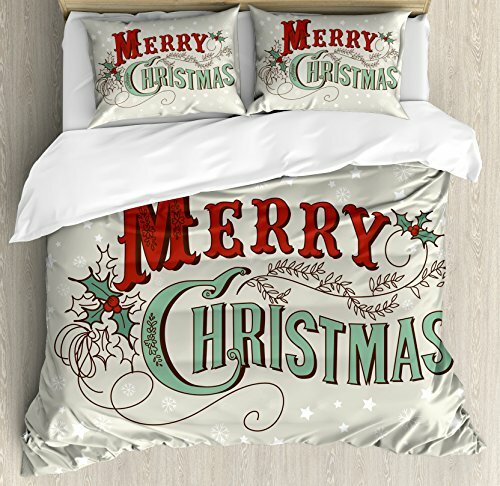 How awesome is this Merry Christmas bedding set? It is absolutely perfect for anyone’s bedroom! Perfect to have it in your bedroom from the end of October until after the New Year! Are you looking for some classy but fun Holiday bedding? Perfect to have in a girly teenager’s bedroom this season! I love how big (and smiley!) snowman is too! It really complements the ‘happy’ and cheerful look! I love the beautiful colors too! 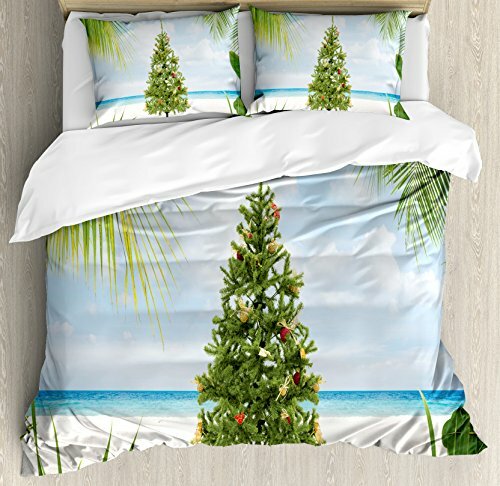 Stunning Christmas Tree on the Beach Duvet Cover Set! Have you ever seen a Christmas tree on the beach? Now you have! What a fun combination! 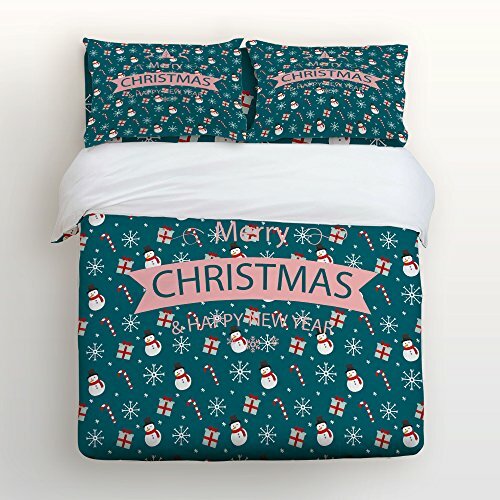 Another gorgeous Christmas theme duvet cover set for sale! *You will also get the cute matching pillowcases! 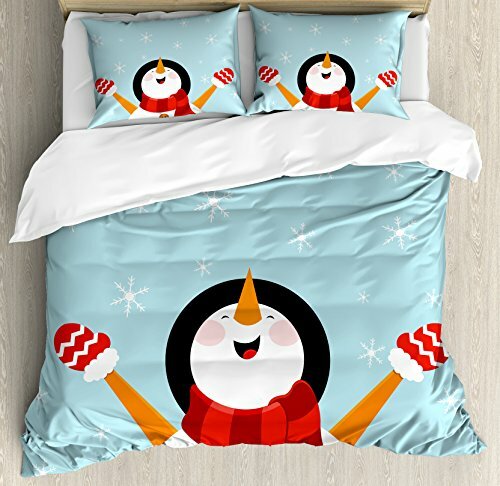 Fun Christmas Themed Bedding Sets in Many Cool Designs! 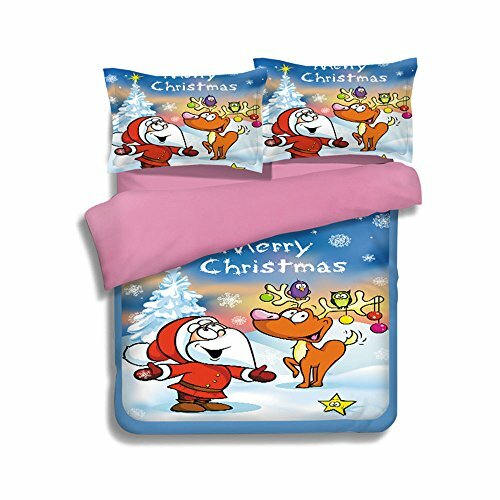 Beautiful and Cheerful Christmas Bedding Sets! I just found not one, not two, not even three, but 20 Christmas bedding sets in ALL sizes and cute Christmas designs!! This is as ‘Christmas’ as it gets! It is a beautiful Christmas Eve scene showing Santa Claus having a ‘chat’ with one of his rendeers! Great to have in your kids bedroom! Oh, and it is also reversible! *Did I mention you can pick among TWENTY fun designs?? Cutest Santa Claus Duvet Cover Set! Santa Claus is coming… to your bedroom! 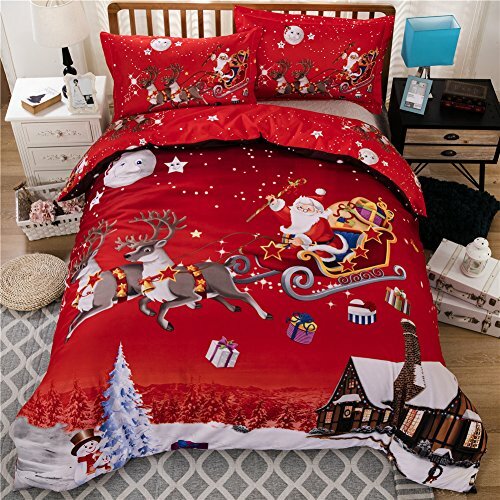 I love this stunning king-size Santa red Christmas bedding set for sale! It is the most festive bedding set from this page in my opinion! The colors are a lot of fun and the Christmas scene is beautiful! It is so warm and inviting! I can hear Christmas bells already! It includes the gorgeous Santa pillowcases! **Available in all bed sizes. You will need to insert your own comforter inside the duvet. I think it looks great, especially for a child’s bedroom. 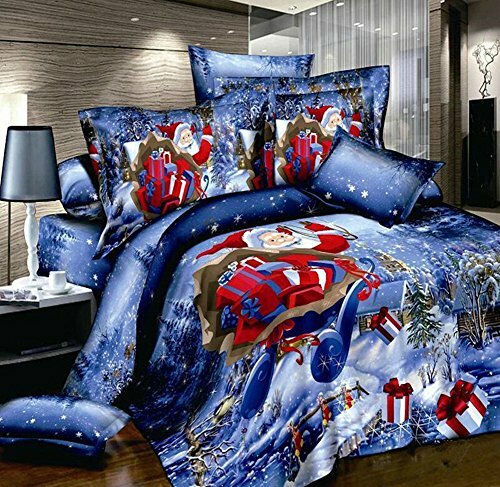 Stunning 3d Christmas Blue Santa Claus Bedding Set for Sale! The Most Fun and Cheerful Christmas Comforter Sets! 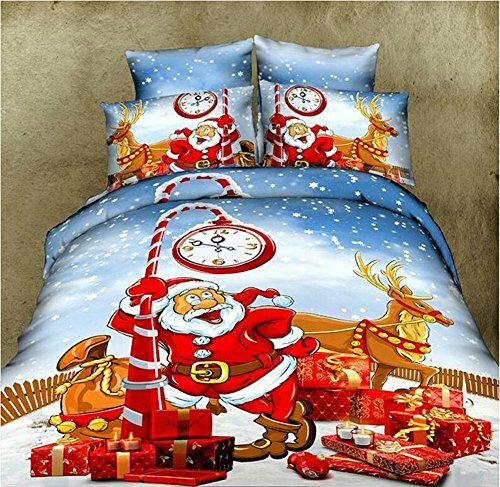 I LOVE this fun and colorful Santa Claus 3d blue bedding set! The colors are gorgeous, it looks very, very festive and it also includes the pillow case and one sheet. It is also one of the most beautiful Christmas bedding sets from this page, and one of the most unique! It’s available in full size. 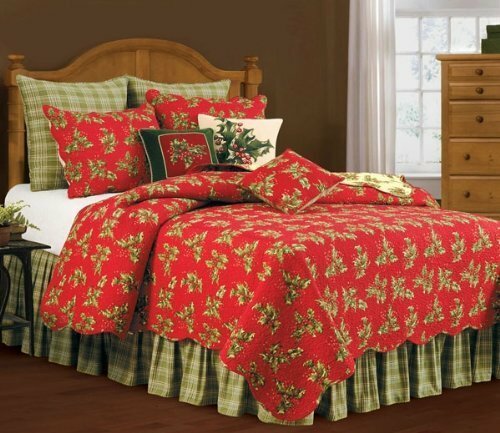 This is one of the most beautiful and colorful cheerful designs Christmas ‘bedding’ I found! It’s a beautiful Christmas decorations bedding set! Cute Christmas colors and perfect to give your bedroom some “Christmas spirit’ touch without having to spend a lot of money! Another beautiful and very festive traditional Christmas quilt set for sale! This set includes the pillow shams, the bed skirt and the beautiful Holiday quilt. What a cute and festive Christmas theme green color bedding set with a fun snowflake, snowman design! You can choose among 4 different bed sizes! Are you in bed yet?? Santa Claus is coming! Right now! 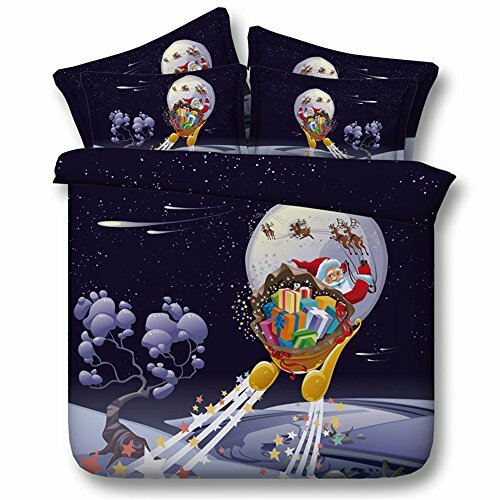 Very cute and very cheerful Santa Claus flying through the night to deliver presents bedding set for sale! The colors and Christmas designs are stunning! It does look like we are right there in person too! Definitely one of the most beautiful Christmas bedding sets I’ve seen! Another FUN Santa Claus Bedding Set for Sale! 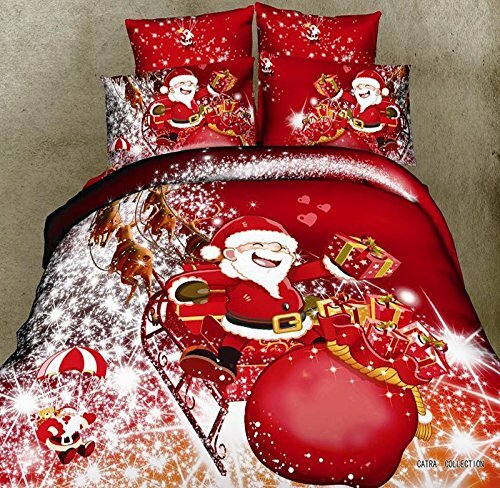 I also had to show you this gorgeous and ultra-FUN Santa Claus bedding set! It seems old Santa is taking a ‘break’! I know what you are wondering! You are wondering if he has been to your house already! Go check under the tree and see for yourself! And I will leave you here today with one of the best Christmas themed bedding designs: A colorful and FUN reversible MERRY XMAS HAPPY HOLIDAYS queen-sized duvet cover, also available in king size and twin size! One side says ‘MERRY XMAS’ printed in huge colorful letters on a cool dark green background and the other side says ‘HAPPY HOLIDAYS’ also printed in big colorful letters on a beautiful burgundy color background! You can switch them out every day!